If you like to eat at well-loved, Columbus-only restaurants or you&apos;re a visitor in town next week, you&apos;re in luck. Columbus Restaurant Week is about to be upon us. Dine Originals Columbus , a group of over 40 locally owned restaurants. From March 9 - 15, Dine Originals member restaurants will offer special fixed-price menus. Price points are $15 and $30, and you can find detailed menu options here . 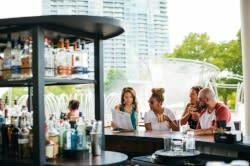 "Whether you want to try a new restaurant or treat yourself to an old favorite, Restaurant Week is a great opportunity for residents and visitors alike to sample the culinary skills of Columbus chefs." These are great deals at great restaurants, so take note that reservations are strongly encouraged. Planning to take advantage of Restaurant Week? Let your friends know with an RSVP on Facebook . You can also stay connected with Dine Originals Columbus by joining their mailing list or the Friends of Dine Originals Facebook group . Which Dine Originals restaurant will you be heading to next week?